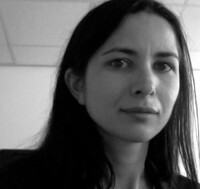 Amalia Sabiescu is a researcher in digital and social change, affiliated with RMIT Europe, the European hub of RMIT University in Australia, and RMIT’s Digital Ethnography Research Centre. She is exploring the interdisciplinary area situated at the interface between information and communication technology (ICT), culture, education and development studies, with a special interest in understanding the interplay between access to and use of ICT and processes of social inclusion, empowerment and social change. She holds a PhD in Communication Sciences with a specialisation in technologies for communication from the University of Lugano in Switzerland. She has been involved in several research and design projects exploring ICT adoption, appropriation and use in situated spaces – from local communities and schools to museums – looking at the emergence of new patterns of social and human-computer interaction, novel forms of cultural production and expression, as well as new patterns of inclusion and exclusion through the media. Amalia maintains an active record of publications and organisation of events and exchanges that explore critical issues at the confluence of culture, development and technology studies. Questions of agency in technology usage, collaboration, co-creation, creative engagement with digital media, and narrative forms of expression are important topics in her research, transcending disciplinary boundaries.